Visual artist and curator. Associate Lecturer and researcher, Central Saint Martins College of Art. Education: BA Fine Art Chelsea College of Art and MA Curating Royal College of Art. The text considers the role of the artist observer in scientific research, by using examples from the author's recent artwork in which conservation constitutes the material fabric. Gravesen employs an anthropological view on the museum conservator grappling with objects that are considered to be imbued with a spirit, and views the schism between a scientific approach and a transcendental belief system as emblematic for the bigger question as to how we currently deal with the legacy of colonialism on western ground. The author subscribes to a view of 'spirited' objects as imbedded agents in the ethnographic museum, enabling change on a social and cultural level, and suggests artistic license as a facilitator for an understanding of the living presence of objects that is beyond the idea of metaphor or representation. A few years ago, during a documentary film production, I found myself in a laboratory at an anthropological museum in London, conducting an interview with a conservator about her research into the significance of a small group of Chinese deity figures in the museum's collection. At this point I had no idea that the philosophical implications of conservation that we discussed, would come to form the material fabric of my future artwork. The ruptures in language were what first captured my attention; the conservator was raising a series of questions to do with museum objects that are considered to be imbued with a spirit, yet here we were, seated in the environment of a scientific lab. My interview subject passionately threw herself at various statements, skilfully searching for adequate terms. We did re-take upon re-take in order to capture the most precise wording, yet, after several hours of interviews I am still not sure whether we managed to cover the complexities of the subject satisfyingly. The figures were all equipped with a small hatch on the back, through which the God-carver would have originally invited the spirit to take residence in the object, as is still the custom in Singapore to this day. Through consultation, the conservator had posed the question to members of the Chinese community in the UK and Southeast Asia, as to whether it would be viable for the museum conservators to open the hatch in order to assess what conservation treatment the figures might need. In front of me was thus a spirit-container, able to manifest an abstract experience (of the threshold between 'inside' and 'outside') on sculptural terms, and as an artist, this negotiation produced by the materials was of great interest. For inspiration, I took the freedom to think of the hatch as a 'spirit door' or gateway. This schism within conservation seemed emblematic for a bigger question that I felt was pertinent: How are we currently dealing with the legacy of colonialism on western ground, and with the meetings between differing belief systems, here science and spirituality, that this legacy produces - inside as well as outside the museum? With my curatorial background and interest in historical collections, it seemed obvious to look into this crucial endeavour from the perspective of the anthropological or ethnographic museum. For inspiration, I began searching for critical and non-Eurocentric voices within conservation, museum interpretation and knowledge production, hoping to find examples of what might be a paradigm-shift towards stakeholder rather than objectivity-driven beliefs. I wondered whether these imbued objects might finally be about to gain a voice of their own that is more than merely symbolic. As an artist who looks for potential spaces of resistance within material culture, I intuitively subscribed to the view, posed by some source communities, of 'spirited' objects as imbedded agents within our Western system of thought, enabling change on a social and cultural level. Like other artists who make use of ephemeral and organic materials, conservation and its ethical concerns has been part of my practice since the outset. In continuing my critical research about the object as an agent for change, I found that contemporary art conservation too might offer potentials for critique. The question as to when, due to extensive conservation intervention, a work of contemporary art ceases to be an original, struck me as a potentially philosophical comment on consumerism and the commodification of art. At times, contemporary art conservation seems at odds with the spirit of conceptual artwork that depends on material 'activity' in order to persist (Barker and Bracker 2005) and this raises interesting questions as to what constitutes the essence of an artwork in the first place. My own artistic upbringing was informed by the idea of objects as agents of social and cultural change, particularly German artist Joseph Beuys' idea of the art object as 'battery' for the accumulation of collective creative energy that has the potential to explode the status quo and give way to a spiritual and cultural revolution (Beuys and Harlan 2004). As a natural consequence of their organic nature, Beuys' art works have in many cases decomposed extensively with time, posing interesting challenges for museums in how to allow them to continue to resonate (Barker and Bracker 2005). Looking at museum conservation within an ethnographic context, it struck me that recognition of the conservation process as a vehicle for social dialogue and emancipation was not unlike the view of a transformative potential inherent in the artistic material. In both cases, the meaning of the object is changeable, and has the potential to act as a generator for exchange. In this scenario, the significance of an object is not determined by its physical makeup, but in the meaning invested in it by the interests of a given audience, and conservation practice here contributes to the unfolding life of an object by instigating material change (Pye 2009). To me as an outsider, the questions raised in the meeting between the rational and metaphysical in the field of conservation, appeared like paradoxical philosophical statements, similar to the seemingly unsolvable Zen kōans that point to the inadequacy of logical reasoning (Yamada 2005). I decided that the modern conservator's struggle to adapt to socio-political changes, and the communities that he or she meets in the process, would become my artistic material or 'plastik'. My idea was that this would enable me to playfully evoke an image of present-day devotion and metaphysics brushing up against reason on a broader scale; a sketch of movement and stasis in interplay, and of the twists in reality that carry transcendental potential. As an artist I use what I call a 'subjective documentary method' in the making of installations and film. The work is based on facts and observation, and the social investigation is then translated into material through a range of processes that involve non-objective fictionalisation. In the sculptural process, I physically mould my way through to a possible 'core' or 'essence' of the sculpture itself, which, once laid bare, is allowed to produce new aesthetic meaning. I am proposing that, on a material level, this process can be seen as a parallel to ways in which intangible meaning emanates from within the imbued object. The format of installation enables the various parts of a narrative to unfold in a multi-layered space, allowing for multiple interpretations. The adding of these new voices is my artistic suggestion for 'imbuing' the objects in yet another realm, this time within an aesthetic field of discourse. My experimental film, Between Humans and Other Things was finished in 2011, and is part of an ongoing series of works under the title The Imbued. It was produced with support from The Danish Arts Council and came out of a longer dialogue with Dean Sully, Lecturer in Conservation at University College London, whose book Decolonising Conservation had inspired my thinking (Sully 2007). Sully invited me to join as artist observer in the events surrounding the conservation of the Maori meeting house, Hinemihi, at Clandon Park in Surrey, England, owned by The National Trust, and the film was commissioned for an exhibition on the dialogue between folklore and contemporary art at the gallery 44 Møn in Denmark. Video 1: An excerpt from Between Humans and Other Things. Hinemihi was purchased as a souvenir by the 4th Earl of Onslow from the Te Arawa sub-tribe in 1892, following Onslow's engagement as Governor of New Zealand, and was shipped 12,000 miles from New Zealand to Lord Onslow's garden in England. For the Maori community, Hinemihi is considered to be a powerful and meaningful structure, an embodiment of a female Chieftain and thus a living person to be actively engaged through human company and performance. This understanding has largely been incorporated within the National Trust's Statement of Significance for Hinemihi (Sully 2007). When I first went to Clandon Park, there had long been talk of Hinemihi being in a state of despondence. Discussions as to how this could be helped, had resulted in a funding bid for conservation work and the design of an additional service building, along with a series of events. The first sleepover inside Hinemihi on English grounds had been planned for summer 2010, inviting Maoris, conservators and National Trust officials to camp on Hinemihi's floor. The modifications of language was what first caught my attention: The National Trust, as well as the conservation community had incorporated addressing Hinemihi as a female, and it was apparent how the notion of a house with feelings had demanded a series of stretches in perception within a Western heritage organisation of today. As an outsider, this seemingly small gesture had a profound impact on how I encountered Hinemihi. When talking with members of the UK-based Maori community I observed a delicate use of language when describing the ways in which Hinemihi was being 'sad', and in talking about Hinemihi's need for a spiritual as well as a material restoration (figure 1). Fig. 1: Still from Between Humans and Other Things. Hinemihi is seen in the far background of the frame. In the film, a split-screen format enables me to use quotes from interviews with Hinemihi's community as text, in interplay with images shot at Clandon Park. The images are my attempt at crystallising my experience of Hinemihi as a spirit 'vessel', and the quotes denote a gradual transition throughout the film, from a scientific voice to that of an animated world, gradually blurring the two and possibly undermining the rational. I have focused on the various thresholds that I was observing, between inside and outside and between humans and imbued house. 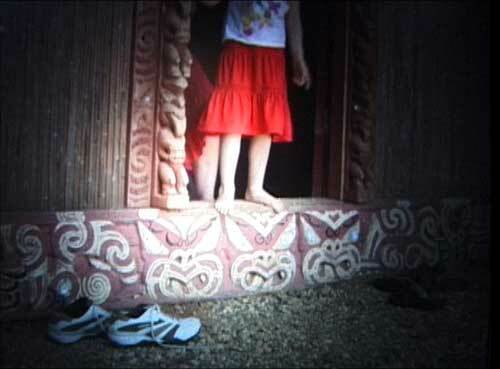 One image shows the feet and legs of visitors as they carefully step over Hinemihi's tall doorway (figure 2), whilst in another, hands are seen touching Hinemihi's carvings. These images are filmed through a lens that adds an abstract still-life quality to the image. A contrasting scene was shot in the studio with Dean Sully and Maina Thompson, a UK-based Maori and descendant of Hinemihi (figure 3). I asked the two to engage with a series of large, specially made photoprints from Hinemihi's history, and recorded their spontaneous dialogue. Fig. 2: Visitors in Hinemihi's doorway. Fig. 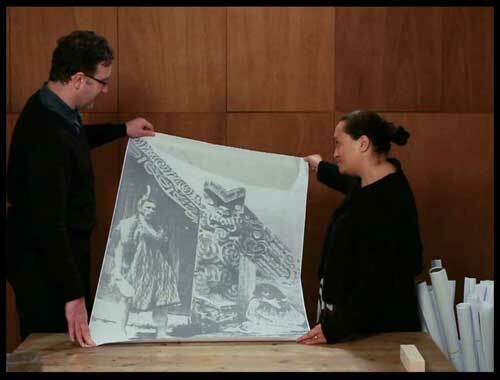 3: Dean Sully and Maina Thompson with a historical print of Hinemihi. The central scene in the film is my recording from the summer sleepover. Here I wanted to create a feeling of being inside and outside Hinemihi simultaneously, and hence installed sensitive microphones inside the house, whilst staying outside with my camera. Seeking to reference the crystallisation of Hinemihi's spirit in my own artistic and material process, I recorded on sensitive 16mm film that has a very tangible quality - the essence of the filmic medium being the reactions of light caught on the negative stock. I decided to film in the short moment between night and day where the light appears as a distillate of matter. At dawn, our sleep and breathing is often at its heaviest, and when listening to the secret sounds of snoring, puffing, creaking air mattresses and crying babies emanating from inside Hinemihi on a cold lawn at Clandon Park, the origin of the word spirit, from Latin spiritus or 'breath' seemed very pertinent, as if Hinemihi was gathering a breath of her own. The remit of my role as 'artist observer' was largely left to my own definition, and I am still reflecting on what art might have to offer to the community as well as to the scientific conservation project. The community surrounding Hinemihi is diverse and consists of UK-based Maori, Hinemihi's descendants in New Zealand, conservators and students, National Trust officials as well as the daily visitor to Clandon Park. Not least, Hinemihi is gifted with the company of a number of strong artists of Maori and Polynesian descent with a unique take. It was important for me that the film was sensitive to this complex reality, but also that I was able to offer my own interpretation, making use of my position as a visual artist coming from outside both the Maori, conservation and heritage world. But what really does the notion of 'inside' and 'outside' mean in a community with a complex constitution, brought together only by its various responses to a house in exile, yet all adding to the reality that is Hinemihi? Maina Thompson was quick to point out that Hinemihi would be capable of embracing my own longing for homeland as a Scandinavian artist in the UK. Spending time with Hinemihi was my opportunity to give something back, and the only way of becoming familiar with her changing scenery, of visitors dipping in and out. Different to the scientist, my position as an artist is characterised by the freedom of interpretation and disruption; what I point to is connections rather than actual facts. But my ethical obligation is of equal priority, and with each new project comes the need for a specific awareness, not least of the dangers of inadvertently promoting ethnographic authority rather than questioning it. When engaging with the various forms of spirit 'containers', I need to gain the confidence of each object individually in order to resist generalisations. Art positions itself on the border between tangible and intangible, and I would suggest that this license might enable an artwork to embody an understanding of the living presence of objects that is beyond the idea of metaphor or representation: In the case of Hinemihi, the house is not like an ancestor, but rather she is the ancestor (figure 4; Linzey 1989). Just like any new artwork begins with a fresh set of questions, it also requires the growing of a new pair of eyes and ears, along with a beginner's mind, free of presumptions, to activate the tension inherent in the material. This allows for a heightened awareness of the subtle connections inherent in a given, everyday moment, by way of 'vibrating' its tonal fibres. Artists too report back to their professional community, but the material manifestations are less formalised than the scientific report or the conference paper. The artistic discoveries can be picked up from the grouping of statements, allowing the viewer to almost unconsciously receive information, which is not made explicit in analytic terms (Bateson 1968). My aim is that the final artwork embraces the continued questioning itself, unfolded in a multi-dimensional, experiential space. The work does not propose answers, nor does it create a summary, but should instead generate a form of awareness of the complexities of human existence. Seen from one angle, the animist object seems to cease its animation once within the museum – but if museum objects can retain potency in the storage box, as it has been suggested (Herle 1994), perhaps art can provide one amongst several catalysts for their activation, by triggering our curiosity and questioning through befriending the material. Barker, R and Bracker, A 2005 Beuys is Dead: Long Live Beuys! Characterising Volition, Longevity and Decision-Making in the Work of Joseph Beuys, Tate Papers [online]. Available at: http://www.tate.org.uk/research/tateresearch/tatepapers/05autumn/barker.htm [Accessed 13 January 2012]. Bateson, G 1968 Naven: Survey of the Problems Suggested by a Composite Picture of the Culture of a New Guinea Tribe. 2nd ed. Palo Alto: Stanford University Press. Beuys, J and Harlan, V (eds.) 2004 What Is Art? Conversations with Joseph Beuys. East Sussex: Clairview Books. Herle, A 1994 Museums and Shamans: A Cross-cultural Collaboration. Anthropology Today 10(1), 2-5, http://www.jstor.org/stable/2783593. Linzey, M 1989 Speaking to and Talking about: Maori Architecture. In: Bourdier, J-P and Alsayyad, N (eds.) Dwellings, Settlement, and Traditions. Lanham: University Press of America, 317-328. Pye, E 2009 Archaeological Conservation: Scientific Practice or Social Process? In: Richmond, A and Bracker, A (eds.) Conservation Principles, Dilemmas and Uncomfortable Truths. Oxford: Butterworth-Heinemann, 129-138. Sully, D (ed.) 2007 Decolonizing Conservation. Caring for Maori Meeting Houses outside New Zealand. London: Publications of the Institute of Archaeology, University College London. Yamada, K 2005 The Gateless Gate: The Classic Book of Zen Koans. Somerville, MA: Wisdom Publications.